I know I haven’t posted anything in awhile, so i’m going to summarize what i’ve been up to. 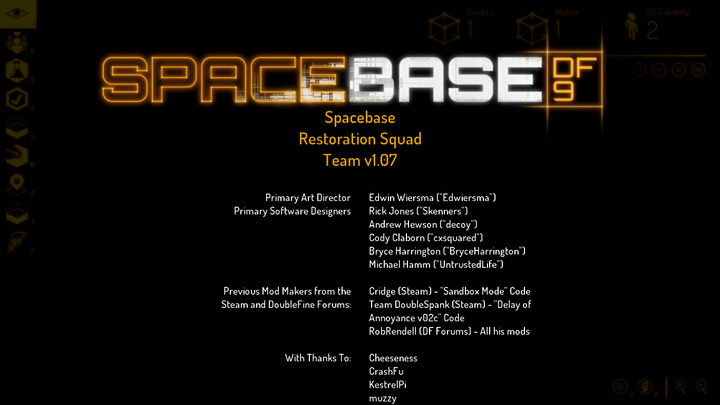 I recently got involved in an open source project whose goal is to complete the game, Spacebase df9, (http://spacebasedf9.com/) which was abandoned by the company “doublefine” after they ran into budget problems. We will be releasing a new patch for that game by Saturday, and ill post here when we do it as-well. The new credits screen for the game. I haven’t had much time to work on roguelegends, but its coming along, albeit slowly, more info on that coming soon. I’m currently in the process of adding equippables and unique items in the same style as the very popular game path of exile.. I have been really busy with school as-well, for those of you who want more info on roguelegends, i’m sorry, i just haven’t had the time.